It seems as though Barry Zito doesn't forgive and forget, or even realize that it is ONLY Spring Training. 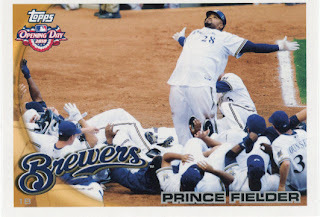 Last season Prince Fielder hit a homerun off of him, and Zito was not a fan of how he was showboating after doing so. You can read the full article here from the St. Petersburg Times. Thanks to Pete from Dropped 3rd Strike for sending me the link to the article. Go to his blog, he busted a boatload of 2010 Topps Heritage .